A flooded basement ranks high on the list of most-dreaded home repair nightmares. 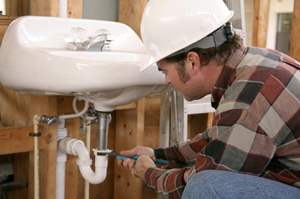 Fortunately, an experienced plumber can keep up with the preventive maintenance that will enable you to take this worry off your list. The threat of a basement flood can come from inside the house as well as from the exterior. The basement of a typical house probably has a tank-type water heater; there may also be a separate water tank. Both of these items can appear deceptively sound and strong on the outside, while rust is weakening tank walls from the inside. When a water tank fails, it does so in a major way. A good plumber knows when it’s time to replace water heaters and water tanks to avoid a major water "event" in your basement. The supply hoses for the washing machine represent another potential leak. The quality and durability of these hoses can vary greatly. Plumbers can check hose condition and —if necessary— replace worn or weak hoses with new versions that eliminate this leak possibility. The sump pump is a star player in your basement. It has to be a strong, reliable performer whenever wet weather starts the flow of water into your basement drainage system. When the water’s flowing and the threat of a basement flood is growing, you don’t want to have any doubts about your sump pump’s ability to do its job. Pump failure. The TripleSafe sump pump has a powerful backup pump that comes on automatically if the primary pump fails. High water volume. If the primary pump can’t keep up with the flow of water into the sump basin, the backup pump comes on automatically, more than doubling pumping volume. Power failure. If there’s a power outage, the TripleSafe will keep pumping, thanks to battery backup that activates automatically. Don’t take chances with a sub-par sump pump. Insist on a TripleSafe sump pump to prevent basement flooding. At Frank's Mr. Plumber, we install only the best sump pump systems available anywhere in the area. We have an answer to clogging sump pumps, power failures, torrential rainfall, and much more! We service Buffalo, Lockport, Tonawanda nearby areas such as Niagara Falls, North Tonawanda, Hamburg, Lancaster, Orchard Park, Depew, Amherst, Grand Island and the surrounding areas.